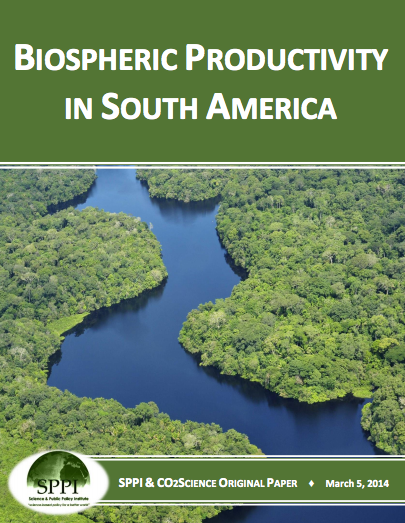 A new paper from SPPI and CO2 Science reviews the scientific literature on biospheric productivity in South America and finds robust evidence that the increase in CO2 fertilization has resulted in ever-increasing forest production. In addition, plants exposed to increased CO2 have been found to lose less water to transpiration, and thus are better able to withstand drought. CO2 fertilization effects strongly increased recent Net Primary Production trends in regional totals. Such a finding is especially interesting, because for most of the past century it was believed that old-growth forests, such as those of Amazonia, should be close to dynamic equilibrium. Just the opposite, however, has been repeatedly observed by several different groups of researchers over the past two decades. Plants exposed to elevated CO2 concentrations are likely to lose less water via transpiration. As a result, at higher CO2 concentrations, plants can better cope under conditions of drought, thereby vastly improving their productivity and growth as opposed to conditions experienced under lower CO2.